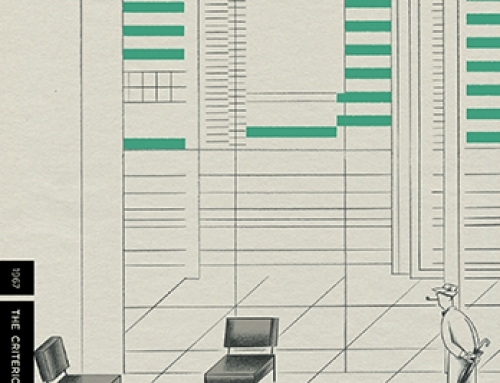 Review of The Criterion Collection Blu-ray edition. Screen captures below are taken from The Criterion Collection Blu-ray disc, but resolution has been reduced from 1920x1080 to 900x506 and slightly compressed. You may click on them to view the 900x506 image. 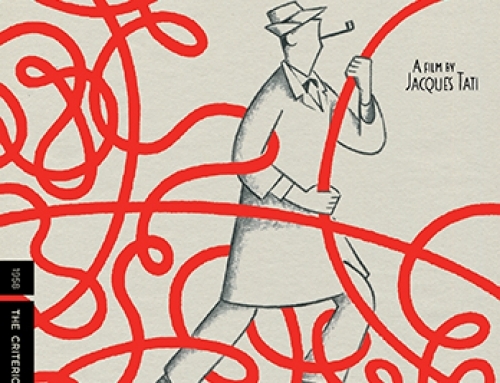 In 1953 Jacques Tati released Monsieur Hulot’s Holiday and, with it, introduced the world to Monsieur Hulot, his affable fool who bumbles around a world we recognize well — a world that we soon realize is much more foolish than he is. The brilliance of Tati’s Hulot is that his interactions poke fun with a light finger and with little judgment, something suggested quite nicely in Monsieur Hulot’s Holiday when Hulot dances with a woman wearing a backless dress. When he approaches, he slips his hand around her and has a moment of minor distress, unsure what to do since his manners prevent him from settling his hand on her bare skin. But he quickly adjusts and places one finger on her neck strap. The moment is over almost immediately (this is a blink-and-you-miss-it kind of film) and forgotten: they dance on, genuinely pleased by the diversion they are sharing. Monsieur Hulot is well known for his baffled navigation through the modern city, with its strange contraptions and customs. There are whiffs of this in Monsieur Hulot’s Holiday, particularly at the beginning when the crowd of vacationers is arriving at the seaside resort (I’ve read it’s in Normandy). We start on a train platform; a loud-speaker is directing the crowd poorly; the people move collectively back and forth, trying to find their way out of the station. 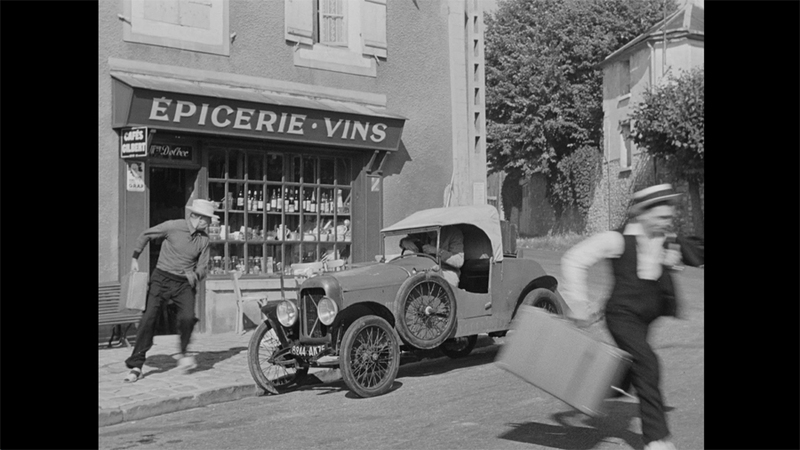 Meanwhile, Hulot’s tiny, old car (a car that will cause him trouble throughout the film) is seen approaching. But the strange trappings of the modern world are mostly left behind as we go on holiday. Here is Hulot carrying luggage up the stairs (and out the back door), there he is wrestling with a horse, and there serving a fantastic game of tennis — or ping pong. Throughout, he runs into the other vacationers trying to enjoy their time at the beach, away from whatever life they’ve left behind. That said, just because the modern contraptions are not present to confound doesn’t mean the vacationers can completely leave modern society behind. Indeed, the resort is a kind of microcosm, members of the various strata of society uniting in this small universe for a short time. A lot of the fun in Monsieur Hulot’s Holiday comes from the rather sad fact that many of these people have failed to leave that world behind, and therefore fail to truly enjoy their holiday. 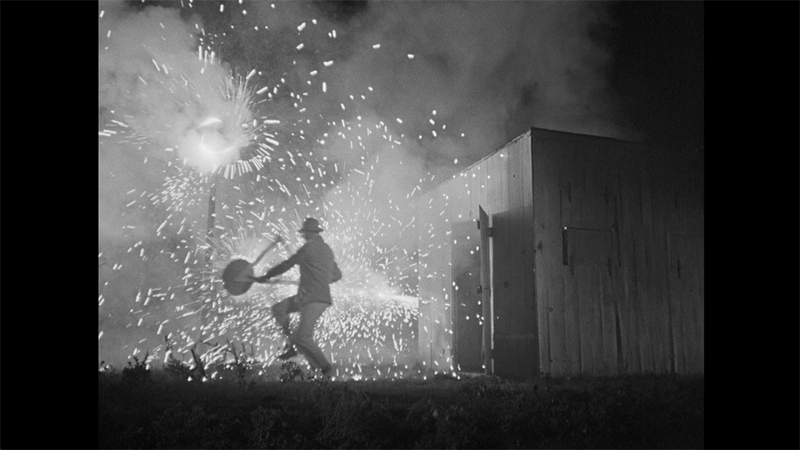 But we won’t let that stop us, and Hulot, for his part, doesn’t let such silly things prevent him from lighting up the dance floor at a costume party — or from lighting up the resort in general in one of my favorite scenes. 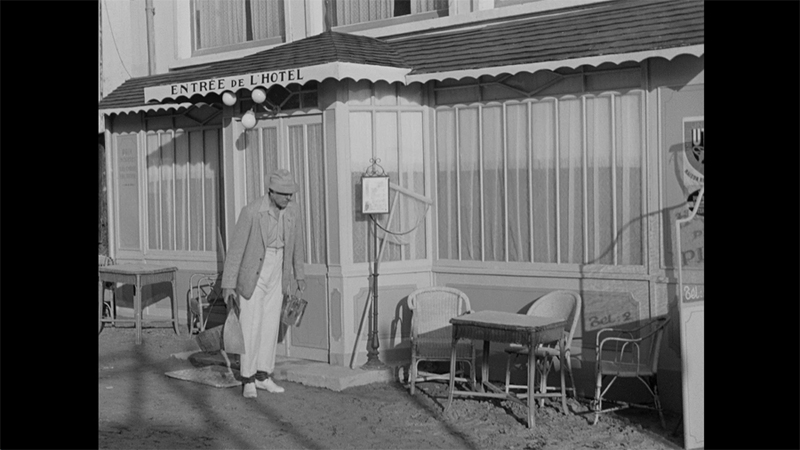 As in Jour de fête, the pace is slow and leisurely in Monsieur Hulot’s Holiday, as suitable for this film as it was in that last one. At one time, Tati allows the camera to linger on a young boy (I estimate around four years old) carrying ice cream from an ice cream cart, up some stairs, and to his other young friend. This pace is refreshing, just like a real holiday can be. In fact, I was dumbstruck when my three-year-old, who loved Jour de fête, sat down and watched this one with me too. I mean, it’s delightful, but I worried it might be too slow or too subtle. But this child, who doesn’t often sit still, surprised me again — and made me proud! And about the subtlety, as I mentioned above, this is a blink-and-you-miss-it kind of film. A second viewing reveals just how much you missed the first time around (and I imagine a third will reveal even more): the gags and commentary occur in layers within the scene and within the sounds (a style that will get more and more complex and sophisticated and rich as Tati’s career continues). The gag itself might not even be happening in the foreground but rather behind a group of characters talking about, say, politics. The soundtrack, as pointed out in Jonathan Rosenbaum’s essay that comes with the Criterion Collection boxset, might actually distract us, to delightful ends, rather than emphasize anything going on on the screen. Yes, this is a relatively complex diversion, but it remains first and foremost, to me, a diversion. I do not at all mean that in a bad way. It is sophisticated, deep, nuanced, and I believe that to create a work like this — with all of the affable characters and the pleasant chuckles, where the tension never builds to stress, and where in the end if feels as if you’ve taken a holiday yourself — is incredibly difficult. For some, this is Tati’s masterpiece, and I understand their argument. Tati’s light touch as he leads us around the dance floor is genius. But let’s just see how we fare when this holiday is over and we return to the city. Mon Oncle is next. Once again, the disc is loaded with fascinating supplements. First, there is an introduction by Terry Jones, initially created when Criterion first released the film on DVD in 2001. It’s only a few minutes long, and it’s not terribly insightful, but it appropriately sets the mood as Jones unleashes his enthusiasm for the film. 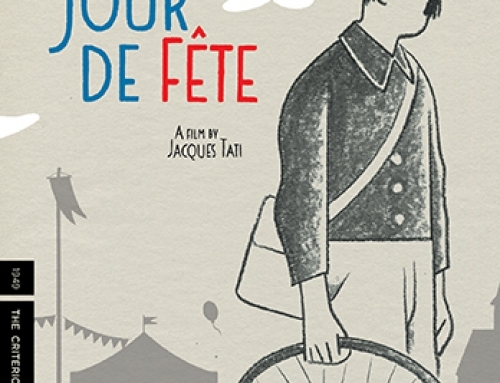 Again, as in Jour de fête, there are multiple versions of the film. The film was originally released in 1953 (and only in black-and-white, the Thomson Color process already discarded). In 1978 (and after Jaws came along and Tati felt like adding a bit of a nod to that seaside holiday fun), Tati re-edited the film and re-released it. The 1978 version is actually a bit shorter than the original (which has, for example, another tennis sequence). As it is the director’s preferred cut, the 1978 version is the version that received the restoration and that Criterion presents as the default feature on this disc. The 1953 version is also included (though, as with Jour de fête, it is presented rather shabbily in standard definition), and I think it shows Tati improved the film in 1978, tightening it a bit here and there, though one shouldn’t skip the 1953 version. The 1978 version also includes an optional English-language soundtrack, which is a nice thing since, if you’ll never miss something on the screen because you’re reading subtitles — the exact reason Tati created this English soundtrack. Besides that, though, the English-language soundtrack is actually different (and not just because of the dialogue), making some of the gags play out to slightly different effects. A nice touch. From 1978, we also get an episode of Ciné regards, a French television program, in which Tati is interviewed. My favorite supplements on this disc, though, are the two rather long, substantive examinations of Tati’s films. 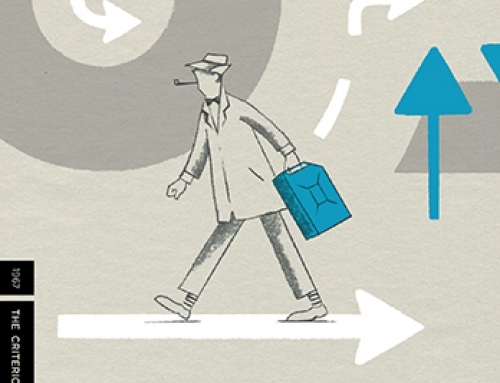 First, our tutelage under Stéphane Goudet continues in a 40-minute 2013 visual essay called Clear Skies, Light Breeze, which talks about the introduction of Monsieur Hulot. Goudet talks about the postman François, and how Tati refused to make a sequel with that particular kind of clown. Instead, we get Hulot. Goudet looks to some of the inspirations of Hulot (like Charlie Chaplin and Buster Keaton), and his precursors in Tati’s own filmography. Then he tracks him through the subsequent films, though Goudet keeps the focus on Monsieur Hulot’s Holiday, talking about the changes between the 1953 and 1978 versions (including the strange reference to Jaws, complete with clothing and hair styles that simply didn’t exist in 1953). Another great Goudet supplement. The last supplement is a fascinating, 32-minute interview with film composer and critic Michel Chion on Tati’s use of sound design. A reader took me to task when I introduced this boxset and called the films essentially silent. Sound is incredibly important to Tati’s films (I meant, though I was sloppy, that the films do not rely on dialogue and call back to a visual humor prevalent in the classic silents). Though this feature is called “The Sounds of Silence,” perhaps the commenter is Chion himself, because this interview shows just how much detail and texture is carefully added by the soundtracks, which Tati composed after the features were created, causing some to suggest Tati directed these films at least twice. Chion calls the sound design, which he traces through all of Tati’s films, poetic. Once again, a fantastic inclusion in this fantastic set. 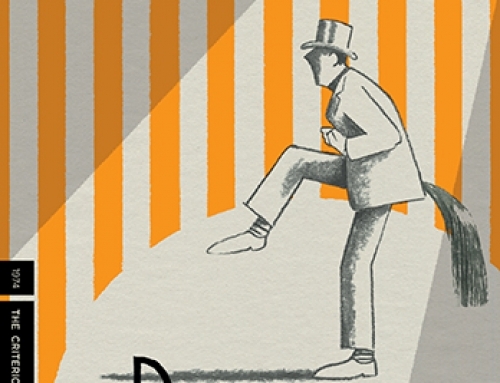 Re the title of this blog: I just read a really excellent book about Joyce. Title: The Most Dangerous Book. It’s the story of the creation of and battle for Ulysses. A striking observation about Joyce about every third or fourth page. 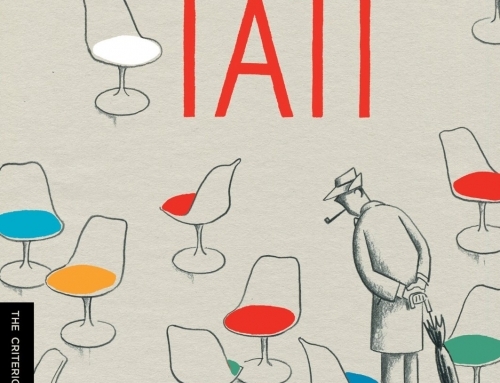 Chion’s book on Tati is very good as is Audio-Vision, a book about how sound operates in film. Chion is also an excellent composer of musique concrete, electronic music that’s created by processing and manipulating recordings of acoustic sounds. Thanks, herblevy. I’ll be checking it out!